This is a photograph of Senator Arthur Capper, left, and President Calvin Coolidge, center, with members of a farm group, which took a two-week tour sponsored by the Kansas Farmer. It featured visits to industrial plants, historic sites, White House, and the United States Capitol. Thirty-two farmers signed up for the tour. The group left November 27 by Atchison, Topeka & Santa Fe passenger train. They made stops in Chicago, IL; Detroit, MI; Windsor, Canada; Buffalo, New York; Schenectady, New York; New York, New York; Philadelphia, PA; Akron, OH; and Washington, D.C. The group spent three days in Washington. 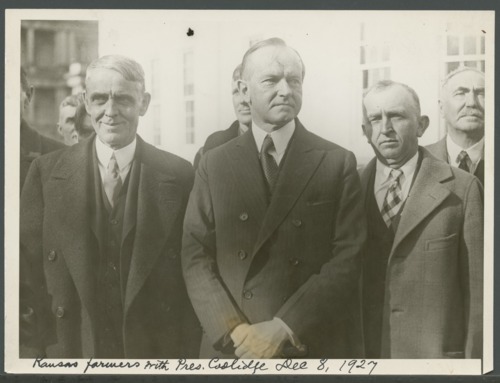 Kansas farmers with President Coolidge in Washington, D. C.